"This universe that we live in is a creation. We're living in, and expressions of, the total field of creativity." 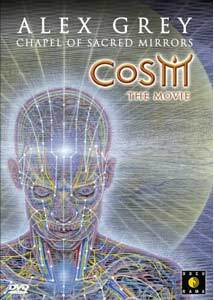 The title CoSM refers to the Chapel of Sacred Mirrors, the New York city installation/exhibition of the work of painter Alex Grey. His work appears here and there, and you may well have encountered it, particularly on album covers (most notably Nirvana's In Utero)—it's hard to miss once you've been exposed to it. The paintings generally feature highly detailed and brightly colored representations of the human form in various stages of transparency. Blood, bones, nerves, viscera are often visible, but the intent is more mystical than medical. The centerpiece of the Chapel is a series of paintings that uncover the human body layer-by-layer, until the bonds that connect us to the universe are laid bare. (If you're turned off by titles like "The Cosmic Christ" and "Universal Mind Lattice", probably best to stay away from this one.) CoSM: The Movie is a straightforward guided tour through the Chapel with the artist himself, as he discusses his paintings, his mystical and highly interconnected worldview, and his influences. They include his wife, his child, and, perhaps unsurprisingly, LSD (aka "the sacred host"). He makes for an interesting and well-spoken, if awfully self-serious host (as well as writer). The work itself is a bit too literal and clever for my taste. As he takes us on a tour of his exhibition, he makes clear that almost everything in every painting is meant to represent something specific. A human form is placed before a periodic table, representing our connection with those elements. Great artists of the past direct their energy into the head of a painter, which the painter then pours out onto a canvas. This type of art can be distancing emotionally; it leaves less room for us to see the work through our own eyes, as we are instead forced to look through the eyes of the artist. The problem is greatly magnified here, as directs the viewer to look at art with a very specific message while being told precisely what it's about. The specificity of Grey's paintings can survive a visit to an art gallery, where the viewer is entirely free to ignore the artist's intentions. Locked into seeing the work strictly from Grey's point of view, though, robs us of any opportunity to forge something new out of our own experience. It's a problem even to the point of camera perspective: too often the camera lingers on minute parts of a painting as it's described rather than offering a broader view. Simply, this isn't a very generous experience. I never once felt that I had any room to breathe or the opportunity to experience the visuals for myself. It's too bad, because the work itself is in many cases extraordinary. As I said, I found it too literal on the whole, but the sheer visual impact of the pieces, the colors, the size, and the intricate detail is immediately arresting. In short, this doesn't really stand on its own as a documentary. It is, however, the closest that someone outside of New York City will get to experiencing Alex Grey's Sacred Mirrors art as it is meant to be seen. Image Transfer Review: Colors here are very well represented, which is important in conveying the quality of the art. There's a bit of muddiness overall, though, and a very slight jerkiness in the frame-rate, which I think more relates to the transfer than the camerawork. Overall it's not bad, it's just not perfect. Audio Transfer Review: The Dolby 2.0 audio track is well-balanced between the background music and Alex Grey's dialogue. A perfectly fine transfer for the presentation. Extras Review: Alex Grey talks in a bit more detail about his artwork and the creation of the DVD in the Alex Grey Interview, the first special feature. It's about five minutes long, and is really just an extension of the main feature, but worthwhile if you've enjoyed that. Next is Behind the Scenes, a 14-minute making-of with the director providing some detail about the filming process. The delected scenes are grouped together as one, and are entirely comprised of extra camera shots of some of the artwork. Again, nice if you've enjoyed the main feature and are looking for a bit more. Finally, the trailer is included along with text bios of the writer and director. None of it is mind-blowing, but it's a fairly generous assortment of extras for a documentary of this kind. I wish that I could give this one a higher recommendation. While I'm not crazy about Grey's art, he has an unapologetic message of harmony and a unique style that are certainly appealing. On the one hand, this is the only way that someone outside of NYC has to experience his Chapel, but it's not a great way to experience it. If you already dig Alex Grey's art, this will certainly give you an in-depth look. Otherwise, I'd think twice.